In a word: wow. Since their 1993 debut album, the Esbjörn Svensson Trio, or E.S.T., as it is usually called, have taken the jazz world by storm, winning numerous awards, playing sold-out world tours, topping the charts, and generally enjoying a popularity that's exceeded that of almost any other jazz group in years. The trio was also the first European jazz group to grace the cover of Down Beat magazine, which led to long discussions about the heritage of jazz and the validity of European jazz; and, naturally, it caused some listeners to perceive an artificial hype and discredit the band for simply not being as brilliant as everyone says they are. Well, do yourself a favor and do not listen to the detractors -- listen to E.S.T. 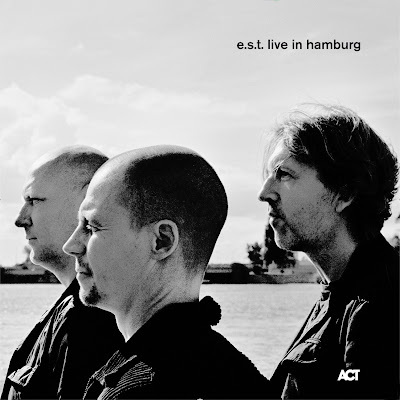 's music instead, and this two-hour concert recorded on November 22, 2006 in Hamburg, Germany, is an excellent place to start, since it shows the superb musicianship of pianist Esbjörn Svensson, bassist Dan Berglund, and drummer Magnus Öström minus any studio trickery; it shows their exquisite communication with each other, their daring improvisations, their effortless flow -- and most of all, it shows their unique brand of music, where a jazz trio can easily incorporate heavy metal distortion during a song ("Definition of a Dog"), then play a sparse, lovely ballad ("The Goldhearter Miner"), and where funk, classical, and avant-garde music elements are incorporated into a sound that never feels academic or difficult to listen to. The band plays everything with the energy of a rock group (Jim Rakete's liner photography even makes them look like one), and the music is often edgy, but the hypnotic repetitions and the building intensity of many tracks often have an almost trance-like quality. The question whether E.S.T. play jazz or pop or rock is completely beside the point: yes, this is jazz, as jazz has always evolved and incorporated new ideas (and almost all of the important developments in jazz have been derided by critics as not being "true jazz" in their time). Yes, this is pop, as it's accessible and, well, popular. And yes, this is rock, with its energy and recklessness. But essentially, it's just unique and exciting music. This review was written for the All-Music Guide on February 10, 2008.